I just love Francisco Stork's style of writing and this 3rd book was moving, difficult, and you so want Kate and Mary to survive what life is throwing at them. Kate and Mary are two sisters with a strict minister father they love and a mother who has been in a vegetative state for two years since a car accident. Kate and Mary's lives are changed after their mother's accident and when her father refuses to keep her in a facility, she comes to their home; with some outside help to care for their mother. Mary has always been a gifted painter but finds it difficult to paint since the accident. Kate has secretly applied to Stanford; her wish to become a doctor and help others. Suddenly their father dies and they are pressured to make decisions about their mother, their home and their life. Stork uses imagery and the sister's thoughts, words, and actions to describe their lives before his death. As Mary and Kate struggle with their love and faith, they will meet people who help them deal with the crises that demand decisions during their time of sorrow. Mary and Kate have such different personalities but their love for each other and their mother are steadfast. It is how they choose to move forward that is so compelling. 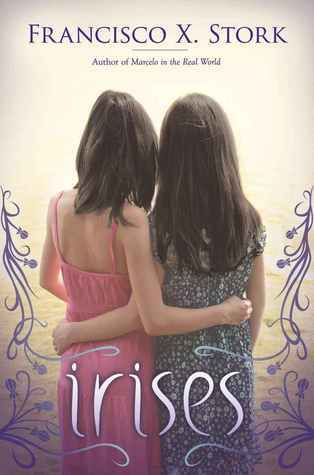 This is a gripping yet beautiful story of the Romero sisters, I highly recommend this. It is deep and I know some students I am definitely going to book talk this to in September. Sign into Goodreads to see if any of your friends have read Irises.